Monkey Business Café is a social enterprise serving delicious food to fellow world changers while providing marketable employment skills to foster and at-risk youth. California State Fullerton 'grows people and food' to empower foster kids with life-long skills. Edison International supports Monkey Business Café in Fullerton, a nonprofit restaurant whose mission is to help foster kids become self-sufficient young adults. Cari Hart-Bunevith remembers Monkey Business Café's early years when the Fullerton restaurant's "kitchen" consisted of a microwave oven, a blender to make smoothies and two sandwich offerings - turkey or the Nutty Monkey, a combination of peanut butter, bananas and honey. The flitting of bees and butterflies from flower to flower isn't the only cross-pollination going on at the Fullerton Arboretum. Cal State Fullerton students work at the campus arboretum alongside teens and young adults emancipating out of the foster care system to grow produce that is then incorporated into meals served at an off-campus cafe. The program, called I-CAN, gives the young people marketable skills before they leave the foster system and provides the students a chance to see how their research has an effect in the community. The world could use a little more compassion right now. Something as simple as a smile from a stranger or a selfless good deed will undoubtedly go a lot further in 2017, a new year already being dominated by divisive rhetoric and fear-based politics. That's why when the Twitter banter gets too intense and the latest news dispatches threaten my sanity, I turn off my devices, grab a book, slap on a big ol' grin and head to Fullerton's Monkey Business, Orange County's only so-called cafe with a cause. Hart Community Homes featured in an Orange County Register article about buying products from organizations that also help people in need. Thanks for all your support for the golf tournament it was a huge success. A special thanks to our event sponsors Class Auto and UPS. 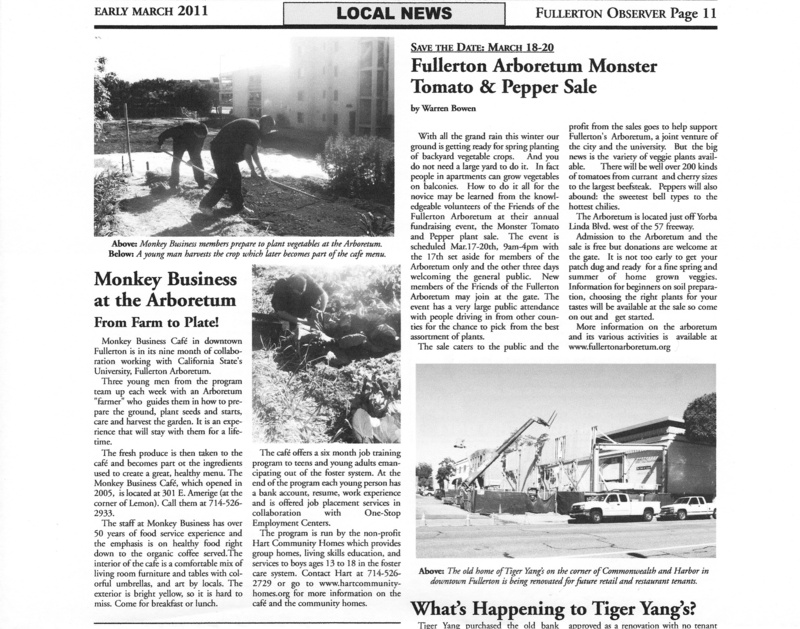 Nonprofit is in its ninth month of collaboration working with California State's University, Fullerton Arboretum. Nonprofit helps foster children learn life skills. The Fullerton Collaborative and The Downtown Business Association has presented its first Healy Foods Certificate to Monkey Business Café. Monkey Business Café is mentioned in Orange Coast Magazine.